Swiss-Belboutique Yogyakarta offers unique location, unique contemporary appeal to business and leisure guests, as well as luxurious yet elegant ambiance, not to mention the world-class personalized services. 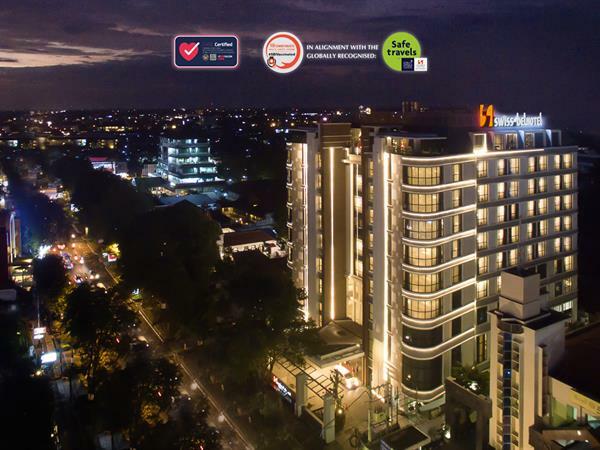 The hotel is centrally located within easy access; only 15 minutes drive to Malioboro shopping district and Sultan Palace as well as corporate and government offices and heritage buildings. It is only 20 minutes drive from Adisutjipto International Airport. The hotel promises a charming convenient stay in Yogyakarta, where guests can immerse themselves in local culture and sample the delights of authentic cuisine, right on their doorstep. The hotel features 122 modern and comfortable rooms in four different categories: Deluxe, Grand Deluxe, Business Suite, Family Super Suite and Executive Suite. All rooms are adapted from a colonial classical style –the aim is to be remembered and memorable and that the elegant design will ensure your stay in Yogyakarta is a comfortable one. The hotel is completed with The Tamansari Puspa Spa and Gym, a modern and elegant rooftop pool, and refreshing artificial water fall at Segaran water fall. The hotel provides a modern, unique style, with prestigious accommodation and meeting facilities to ensure a truly welcoming and convenient feeling for business and leisure travelers alike. There are 8 meeting rooms, perfect for all business meetings, incentives, conferences and exhibitions. For a dining experience, our hotel offers delightful dining options for both international and local dishes. Breakfast, lunch, and dinner are available in buffet or a la carte at Swiss-Café™ Restaurant. Stay in touch with all the latest news in Yogyakarta. Swiss-Belboutique Yogyakarta features 122 guestrooms including Deluxe, Grand Deluxe, Business Suite, Family Super Suite and Executive Suite. All of our great hotel rooms in Yogyakarta are equipped with LCD cable television and satellite international channels, IDD telephone, high-speed internet access via cable or Wi-Fi which can also be accessed in public areas, in-room safety deposit box, coffee and tea-making facilities, individually controlled air-conditioning, mini-bar and bathub or shower. For a dining experience, our hotel offers delightful dining options for both international and local dishes. Breakfast, lunch, and dinner are available in buffet or a la carte at Swiss-Café™ Restaurant. Gendhis Bar, a lobby lounge bar style, is perfect for any leisure time while you enjoy the live instrumental pianist. Kahyangan Lounge is the perfect place to relax in a cozy setting especially for Swiss-Belhotel members or those who overnight in a suite. Swiss-Belboutique Yogyakarta offers a full set of amenities and facilities, available for our guests. Take time to work out in our well-equipped fitness centre, or relax at the swimming pool while catching the sunset or having evening time there. The gym is located on 10th floor and is available for all guests. Or indulge yourself with our wide range spa treatment in Tamansari Puspa Spa. Yogyakarta despite the official spelling, the name is usually pronounced and not uncommonly written Jogjakarta or just Jogja (JOGH-jah) is a major tourist destination in Indonesia. It's the capital city of Yogyakarta Special Region which is in the southern part of the Central Java province, Indonesia.